The City of Richmond Hill, GA is a major residential area with deep historical roots through Henry Ford and the Ford Plantation. Since 2000, the City has used Spatial Engineering to provide Geographic Information System (GIS) services in managing and documenting water and wastewater assets as well as support services like zoning, permits, and historical preservation. Initially, data access was limited to the City Planner and Fire Chief due to the cost of desktop software and training. 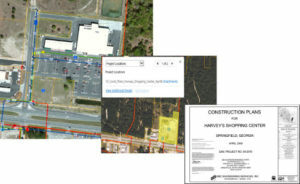 Spatial Engineering implemented Richmond Hill Enterprise GIS using web technology giving all City employees access to GIS data. RightSpot GIS Services manage and maintain the GIS data as the City’s GIS department. The City provides record drawing updates of utilities, zoning and other features that Spatial Engineering updates and manages the city’s GIS. The City employees and their designated support contractors access the GIS through RightSpot’s web interface.